How Can I Make Kefir Grains At Home? Is It Possible To Make Kefir Grains Without Buying Them? I get this question a lot and it was a question I had as well. There are not too many things I won't try if it is not too complicated, so I went about researching how to make my own kefir grains. I found most sites said that it was not possible. That in order to make kefir at home you had to purchase kefir grains from someone who had an overabundance. I did find one site where a gentleman claimed to do something with an ant hill. (see here… it is funny but be warned he uses the 'f' word a couple of times.) Now I know there are people who will believe anything if it is written on the internet, but I KNOW you won't be making kefir grains this way so please do not try it, or if you do try it, please do not drink it. OK you have been warned! Now, on to the real way to make kefir grains. 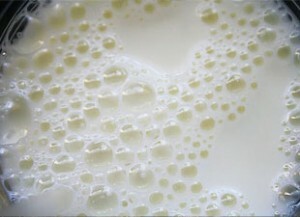 No one had ever successfully made kefir grains that they could then take and use to culture milk. That is, no one until Motaghi, et al. These Iranian scientists took goat hide and formed a sac. Then they added milk, and bacteria from sheep feces. They shook the bag several times a day, kept it at a consistent temperature of 24-26 Degrees celcius for 48 hours and then changed the milk. 12 weeks later they were able to scrape some coagulated residue stuck to the inside of the bag and put it in milk in a glass jar and make kefir. I think I’d rather drink smashed up ants in milk than feces. Yes well, you could buy the grains and avoid all the unpleasantness completely! Hi, I am about to order some water kefir grains ans also i would like to buy some kefir milk as well. Do you have any available !! Hi Elaine I sent you an email.